Whether studying late or partying until dawn, more and more people now turn to energy drinks to keep them up and running. The detrimental effects to health resulting from prolonged energy drink use have been well documented, yet this hasn’t stopped sales one bit. Moreover, researchers in Australia claim that adding energy drinks in alcohol cocktails will enhance the user’s urge to drink, further fueling alcohol intoxication and increasing the risk of accidents that follow as a result. When combined with the findings of previous studies that show mixing energy drinks with alcohol can cause alcohol dependence, things become even more worrisome. With this in mind, policy makers might want to seriously consider the status of energy drinks on the market. Lithuania, for instance, made a bold move by banning the sale of energy drinks to anyone under 18. “A number of cross-sectional studies show that young adults who mix alcohol with energy drinks (A+ED) have higher levels of alcohol consumption than their peers who don’t mix energy drinks with alcohol, and some studies suggest that this practice increases the risk of ‘binge drinking,'” explained Rebecca McKetin, a fellow at the Australian National University’s Centre for Research on Ageing, Health and Well-being. “However, it may simply be the case that people who drink more often are more likely to drink A+EDs among other things. 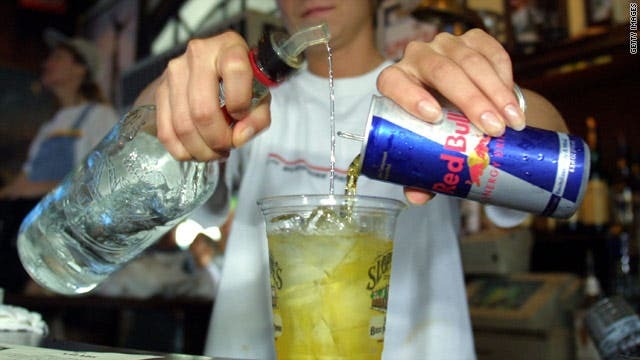 Yet if it is the case that energy drinks increase binge drinking, the popularity of A+EDs could exacerbate alcohol-related harms among young people, particularly harms related to intoxication, such as car accidents and injuries from fights or falls.” McKetin is also the corresponding author for the study. The researchers enlisted 75 participants (46 women, 29 men) aged 18 to 30 years for a double-blind randomized pre- versus post-test experimen, where they would be served either alcohol-only or A+ED. Participants received a cocktail containing either 60 ml of vodka and a Red Bull® Silver Edition energy drink (n=36) or 60 ml of vodka with soda water (n=39); both cocktails also contained 200 ml of a fruit drink. Participants were asked about their urge to drink before and after serving their drinks. Findings appeared in the journal Alcoholism: Clinical & Experimental Research.